Pecan trees (Carya illinoensis) grow in deep, fertile soils associated with creek and river bottoms. Although they are native to the Mississippi River bottom as well as parts of Texas and northern Mexico, modern irrigation methods allow them to be grown in drier climates where there is less chance of fungal diseases. 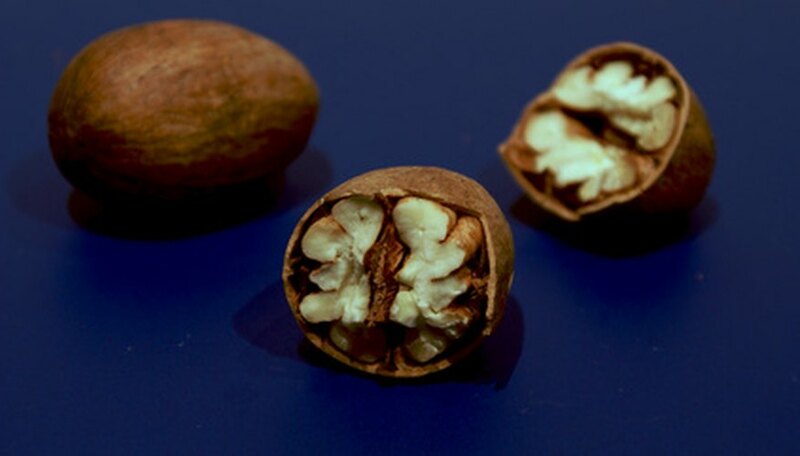 Because pecan trees grow best in areas with mild winters and a long growing season, their range is limited to the southern half of the United States. The main feature of the pecan tree root system is the large tap root. The tap root grows straight down from the main root ball. It is used specifically for obtaining water and is especially useful in areas where the water table fluctuates. The tap root of a pecan tree looks like a giant brown carrot and varies in size depending on the depth of the water source. If the water table remains shallow, the tap root will only grow into the water source, but if the water table suddenly drops, the tree can die from lack of water. That is why pecan trees perform best where the water table is 6 feet deep or deeper. This allows them to establish a deep, extensive root system. The other roots that form on the root system of a pecan tree are called feeder roots. Feeder roots extend outward from the tree trunk and are just under the soil surface. They capture nutrients and rainfall. Feeder roots look like tree branches and are covered with smaller, hairy growths known as root hairs. The tap root grows very large, and can go down as far into the ground as the tree is tall. The feeder roots can extend three times farther from the trunk as the longest branches. For example, if the branches extend from the trunk 7 feet, the feeder roots can extend outward 21 feet or more. Because pecan trees grow very large, up to 100 feet tall, and develop such an extensive root system they must be planted at least 60 feet apart so they don't compete with each other for water and nutrients. Planting pecan trees during the winter, or dormant season, allows the root system to develop before the heat of the growing season arrives. Pecan trees are often purchased bare root, which means they are not planted in a container when purchased. The roots of bare root trees should not be allowed to dry out before planting. The planting hole should be deep and wide enough to accommodate the root system without bending or stressing the roots in any way. The tap root must be buried pointing straight down so it grows downward. Many people believe cutting the rap root will kill a pecan tree. While this is true in some cases, the tree will usually create multiple tap roots after the main tap root is cut if it has enough water available to get through the healing process. However, multiple tap roots are not as capable of reaching as far into the earth in search of water as one main tap root.